As the cold deepens, and the crisp winter light edges through the leafless trees, I find myself becoming more reflective. Perhaps I am more deeply reflective as I turn 50, and like the trees, feel increasingly bare. Winter seems to bring forward the griefs and grievances, the losses, but also the release, the stillness and the focus. The waving and talkative leaves drop, the trunks reach quiet and strong into the expanding sky. I reflect on my writing life and realize that I am similar to my grandmother in three ways. Around the age of 50 she began to paint; she woke every morning at 5 a.m. and painted until 8:00 before heading to open the bookstore (chignon, white silk scarf, high heels). She had no training; she just began (oil, canvas board, kitchen). She never exhibited despite an offer from the paint shop and gallery where she bought her oils. The paintings filled the walls of her tiny apartment, were piled in stacks in the cupboards, packed into suitcases and brought back to Canada, lined the walls of her children and grandchildren’s houses. Like her, I am just beginning. One of my earliest memories is wanting to be a writer. I have written almost constantly - in my head, on scraps of paper, in unorganized journals. I have a bit of training but the real learning comes from doing. Like my grandmother, I rarely send anything out into the world. The pieces are often unfinished, left on the easel. Stacked away for later. Like my grandmother, at 50 as my life is changing emotionally and physically, as the demands of single parenting shift, I am beginning to write it down. I am beginning to form what I write. My writing life - my writing day - involves writing around and through a myriad daily activities and responsibilities and pleasures - work, caring for my mom, dancing with (and around) my daughter as she emerges as her own woman in her own creative life, poking away at my PhD - all as I recover from illness. My writing day isn’t always about pen to paper, but also about reading, composing in my head, walking, connecting with other writers: anything that is about the practice. My visual art practice (watercolour, installation, textile) is also re-emerging after many years working as an arts administrator, my visual and creative work riffing off of each other, sometimes layering into each other, sometimes pulling me in different directions. I am learning to be a hawthorn tree - to protect my time and energy and still provide the fruit, however sour (sweeten to taste). Influenced by my background in geography and visual arts, I keep a series of filedbooks (text/ile project, river project, daily walks, Jameson project) in which I write words, titles, lists, sketch, gather ideas, visualize connections. 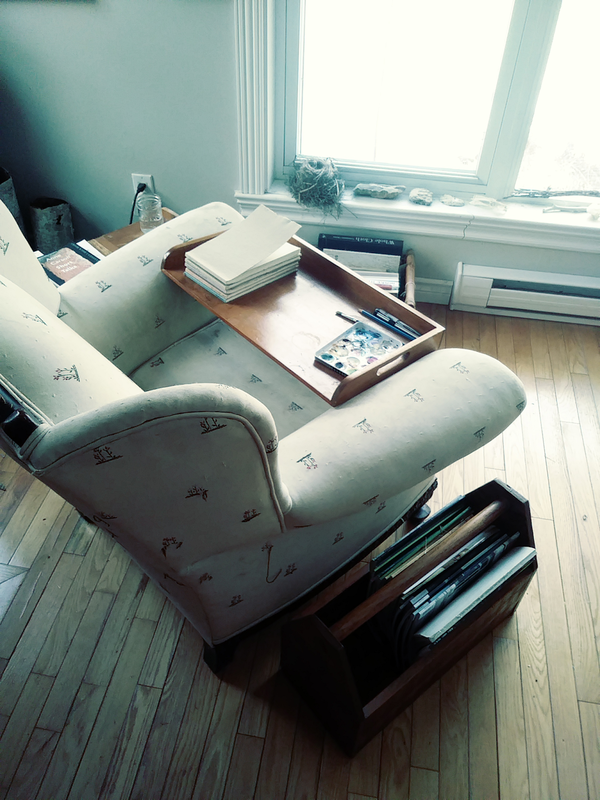 I tend to work on paper, in notebooks/fieldbooks, sitting in my armchair by the window (messy hair, long johns, alpaca socks). I write on my lap on the chair, but a lot of the writing still happens in my head - usually while walking - before it is written on paper, and before I type it up. My practice increasingly involves talking to other writers online, and looking at calls for submission. Most recently, I created a Poetry CSA (Community Shared Art) project to create a structure, an audience and a commitment to write regularly. I read voraciously. Stacks of novels and poetry collections, art magazines, literary journals, and art books are in every room. I read different work depending on mood, time of day, and follow the tracks of my various and shifting obsessions (currently hawthorns, the process of abscission, ashes, the changing river). I try not to think about passing time (mostly unsuccessfully). sophie anne edwards is a geographer (PhD ABD), writer, curator, visual artist, community animator, and single mom. She lives on Manitoulin Island | Mnidoo Mnising in northeastern Ontario in a house on the North Channel. She has a small smattering of published work in northern Ontario anthologies, h&, the ottawa poetry newsletter, and a short story produced for the stage by Debajehmujig Storytellers. A chapter is forthcoming in Geopoetics in Practice (Eds: Eric Magrane, Linda Russo, Sarah deLeeuw, Craig Santos Perez). She has a Certificate in Creative Writing from the Humber School for Writers where she learned from D.M. Thomas and Olive Senior. Like a dog she needs daily walks and usually returns home with deer bones, sticks, and rocks. Really liking all the feelings that you have brought forth and written down. Has a calming effect on me and helping me breath more slowly and more deeply. Thank you Sophie!